In an important development just days ahead of the Lok Sabha elections in the sugarcane belt of Western Uttar Pradesh, the Yogi Adityanath government has reversed Akhilesh Yadav cabinet’s decision to waive off interest payment by defaulting sugar mills in three successive crushing seasons during 2012-15. UP cane commissioner Sanjay Bhoosreddy today filed an affidavit in the Allahabad High Court apprising the bench of the state government’s decision, which would necessitate interest payment by mills. The units running in losses are liable to pay interest at a rate of 7% per annum, while those making profits would pay farmers at a rate of 12% interest. During the 2012-13, 2013-14 and 2014-15 crushing seasons, the sugar mills in UP had defaulted on payments of nearly Rs 2,000 crore, including interest. Later, in April 2015, the millers had approached then Akhilesh government proposing to pay farmers without the interest component owing to their purported precarious financial condition. In October 2016, the Akhilesh cabinet had waived interest owed by mills to farmers. However, Rashtriya Kisan Mazdoor Sangathan (RKMS) challenged the decision in the HC seeking relief for farmers. On March 9, 2017, the HC had, after subsequent hearings, quashed the Akhilesh government’s decision to waive interest liability of mills and termed it as arbitrary as cane growers’ interest was not protected. The court had observed that by the same logic, the liability of farmers on loans taken from public and cooperative sector banks be also waived. The court noted that in this case, the farmers were basically supplying cane to mills at zero interest, even while borrowing at 10-15% or more. Meanwhile, RKMS is preparing to file an objection on the next date of hearing (April 26) against the two slabs of 7% and 12% interest and plans to seek direction to mills to pay a flat 12% interest rate. “Interest payment would ensure that mills would pay farmers within the stipulated 14 days of buying sugarcane from farmers else they would attract further payment liability on account of interest,” RKMS convener V M Singh told Business Standard adding the total liability of mills on this account for the three crushing seasons could touch almost Rs 1,800 crore. He added that the case would serve as the precedent for successive crushing seasons and deter mills from holding up farmers’ payment. Currently, UP millers are burdened by a massive outstanding of more than Rs 10,000 crore for the current season 2018-19. Prompt sugarcane payments were one of the flagship pre-poll promises of the ruling Bharatiya Janata Party (BJP) in the run-up to the 2017 UP polls. Of the total operational 119 sugar mills, around 94 are privately controlled. Last year, the Adityanath government had even floated a soft loan scheme for the beleaguered private millers. It was provided to mills whose payment ratio stood at more than 30% during for 2017-18, with the eligible units being sanctioned with soft loans totalling a little over Rs 2,900 crore. 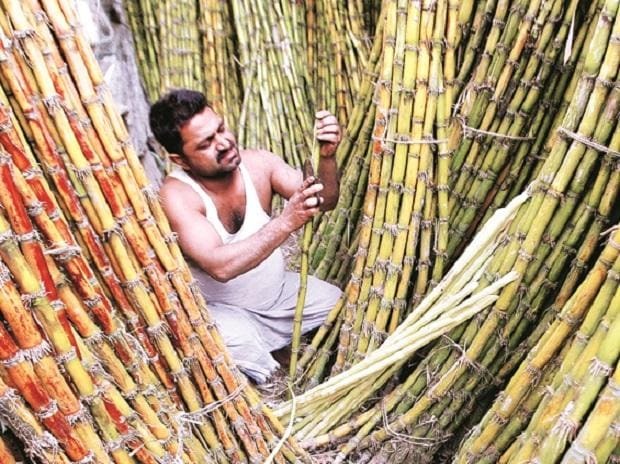 While the opposition has been sharpening attacks on the government over mounting arrears, the chief minister has been claiming credit for ensuring total sugarcane payments worth Rs 60,000 crore during the past two years, including the unpaid arrears pertaining to previous crushing seasons.